All three divisions – static, scale and sail – were well represented in the MMM booth at this year’s Sportsmen’s Show at the International Centre. 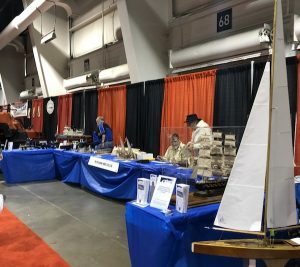 This was the first time the club had a display at the five-day event that is attended by upwards of 66,000 people. 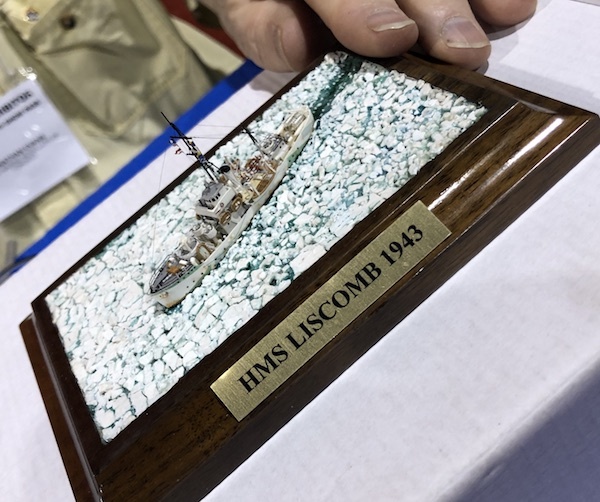 Jonathan Evans brought along his recently completed scale model of the HMS Liscombe, one of six Western Isles trawlers built in Canada for the Royal Navy, then loaned to the RCN. HMS Anticosti, Baffin, Cailiff, Miscou (Collingwood Shipyards), Magdalen, Manitoulin, (Midland Shipyards), Ironbound and Liscomb (Kingston Shipyards). All launched in early 1942 and commissioned that fall. 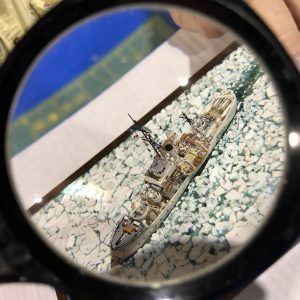 Mostly manned by RNVR crews with additional officers and sailors of the RCNVR. Vessels where returned to Britain post war and many were sold to Norwegian commercial companies. 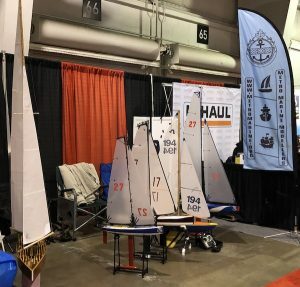 Rigging: Modelkasten, .047 & .040mm metal rigging, Caenis thread for life raft tie downs. Broken Ice off St. John’s: thin ‘sandwiched’ plaster, ‘Future/Pledge’ water. 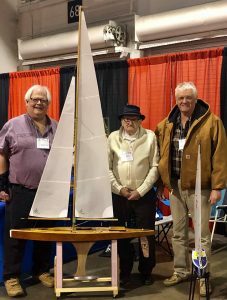 Toby Barrett, MPP for Haldimand-Norfolk (right), dropped by the Metro Marine Modellers booth at the Toronto Sportsmen’s Show. With Toby are MMM members Rick Levick and Charlie Mann (age 92 and still racing after 50 years with the boat he built named after his late wife Betty). Toby is also Parliamentary Assistant to the Minister of Natural Resources.